The community of Shorecrest is part of unincorporated Mason County. It's located across Oakland Bay from the city of Shelton, and includes part of the Hammersley Inlet. Homes for sale here are a mixture of single family residences and manufactured homes, many with waterfront lots or views. Toted as being a community for all ages, the official "Shorecrest Beach Club" offers residents a heated swimming pool, barbecue pits, covered picnic areas, a boat launch, parks and club house. Blue Summit Realty has the most accurate and up to date Shorecrest real estate listings on the web. Currently there are 2 homes for sale, and 24 vacant land properties in Shorecrest. Of the 26 total Shorecrest residential listings for sale 0 are bank owned, 0 are short sales, 0 are new construction, and 0 are townhomes. The price ranges from $96,000 to $0 with a median list price of $165,500 and median sold price of $229,000. Make sure to refine your Shorecrest real estate search by property type, price, square footage, bedrooms, bathrooms and more with the search tool above or view the Shorecrest listings on our interactive map. 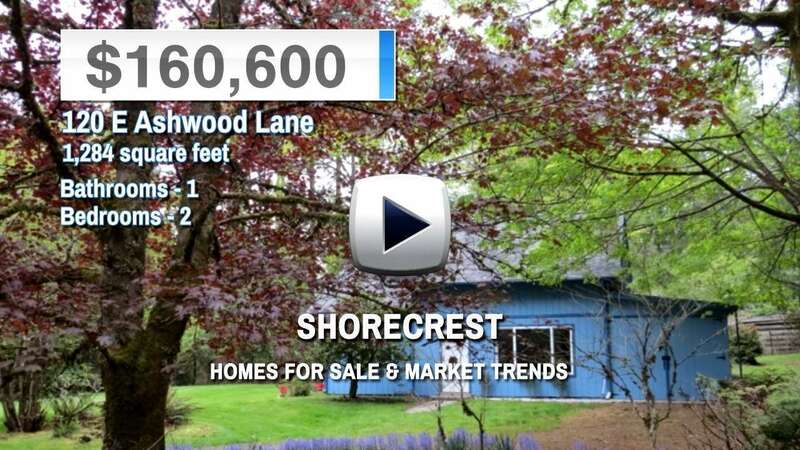 Our Shorecrest real estate listings were updated 22 minutes ago.